Special 1st Edition NOW OUT! 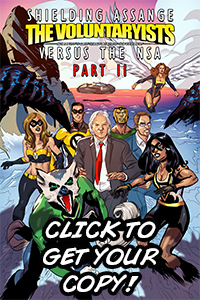 A special 1st Edition of the Voluntaryist comic is now out! It represents a closer build to the original goal with the first Indiegogo fundraiser. 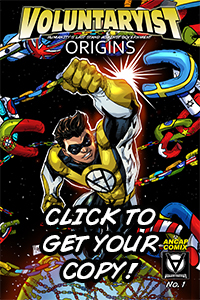 This special edition includes a new artwork of the Voluntaryist characters by Garrett Trujillo and Adam Metcalfe. 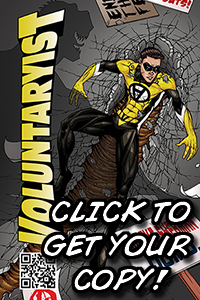 Print copy of Voluntaryist – Issue No. 2 now available for purchase! Print copy of Voluntaryist, Issue No. 2 now available for purchase! Click the link below to take a look inside! Sneak peak on some comic review. 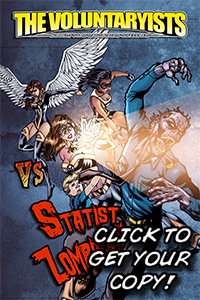 Working over the script and artwork for Voluntaryist Issue No. 2! A sneak-peek look into the AnCat comic sequence page. Stay tuned for more! 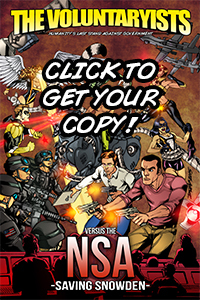 Voluntaryist and Volarchist team up to fight tyranny!